The green in auroras is caused by the ionization of oxygen in the upper atmosphere. Nanometers ( nm ) and angstroms ( Å ) are linear measurements used to describe very small distances. These measurements often appear in applications of spectroscopy and the sizes of atoms. This example problem shows how to convert nanometers to angstroms. 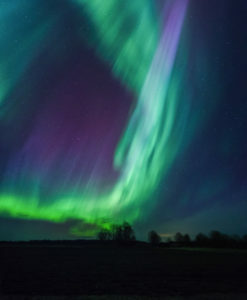 Question: The vivid green light seen in aurora displays is caused by the excitation of oxygen atoms. This light corresponds to a wavelength of 557.7 nm. What is this wavelength in angstroms? Solution: Both nanometers and angstroms are related to the standard meter. We can use the ladder method of unit cancellation to obtain a conversion factor between the two measurements. Now we can use this to find the wavelength. Set up the conversion to cancel out the unneeded unit. Answer: The green light in aurora displays corresponds to a wavelength of 5577 Å. The easiest way to convert nanometers to angstroms (and back again) is to remember there are 10 angstroms in a nanometer. Just move the decimal in the correct direction and remember you should have more angstroms than nanometers when you’re finished.